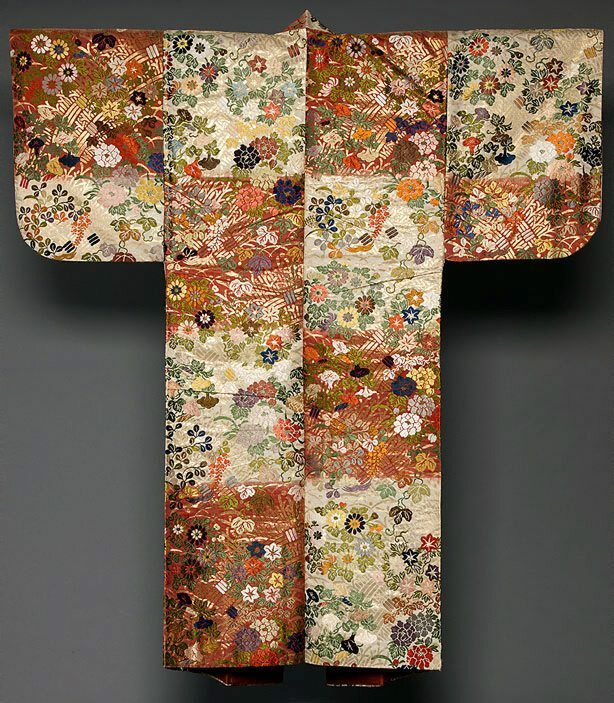 Costumes for nô performance embody the highest achievements in Japanese textile and are an important part of the art of the samurai class that dominated Japan for 700 years prior to the mid-19th century. Unlike kabuki, the commoners' theatre, nô plays were characterized by their spiritual intensity, traditionally performed only once at special occasions: festivals, dedication to the gods/ ancestral spirits, welcoming important guests and so on. Of all nô costumes, 'karaori' (Chinese weave) is considered the best because of its special quality: all patterns are woven instead of embroidered, a technique developed in imitation of Chinese textile. 'Karaori' robes with red colour are worn by performers in young female roles. The design, flowers of the four seasons, makes this piece particularly bright and attractive. Asian Art Department, AGNSW, 15 October 2002. Art Gallery of New South Wales annual report 2003 [for the year ended 30 June 2003] , Sydney, 2003, 2 (colour illus. ), 21 (colour illus.). Art Gallery of New South Wales Annual Report 2004 , Sydney, 2004, 17 (colour illus.). The Asian Collections Art Gallery of New South Wales , 'The World of Samurai Culture', Sydney, 2003, 211 (colour illus. ).